New PDF catalog information. 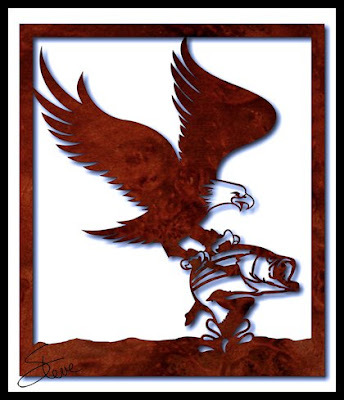 Plus Large Eagle Hunter Scroll Saw Pattern. You are going to have to glue up a large panel for this project. The pattern is ~12 inches tall and 10 + inches wide. This will be a challenge to cut just because of the size and some of the smaller interior cuts. You may also consider cutting it from a panel of 3/4" thick Baltic birch plywood. The most difficult section will probably be the eagles head. Make sure you do the interior cuts of the head before the exterior. When you cut the exterior fudge a little around the head to keep it thicker if you feel it's getting weak. There have been a few questions about the new PDF catalog that I did not anticipate. Here are a few of the questions and answers. Can you fix the broken links? Yes that will be in Version 2. As a matter of fact Version 2 is ready to download now. If everyone tried to download the update right after the email newsletter goes out it will probably get sluggish. Jusr wait a couple hours and try again. I may do a couple more quick updates if I find any other issues. Just go back to the bookmark you made of the download page and download again. Run the new setup and it will do the update.This will fix a few bad links and I added a link to the download page in the program. This will allow you not to have to remember the url of the page. Why will the catalog not print? 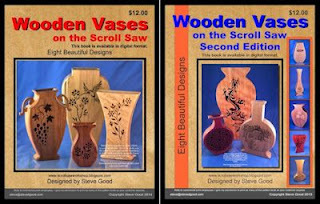 Understand the the main catalog is just 200 pages of color pictures of the patterns in my online catalog. You probably do not want to print the main catalog. It will get very expensive and use lots of ink. That's not what it is for. 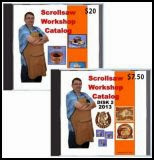 It is to browse the patterns and select one to download. You can then print that pattern once it downloads. Just print as normal. Can I copy and paste the name of the pattern into the program? No the names of the patterns in the main PDF are part of the image. They are not text and cannot be copied into the clipboard as text. How can I report a bad link in the catalog? So far I have been made aware of a few bad links. Some I have already fixed and a few will have to be fixed in the next update(Version 2 now ready). I will push an early update once I think I have fixed most of the errors. If you find a bad link just email me. Put "pdf catalog bad link in the subject"
Why can't I print the pattern I download? My PDF catalog program does not control the printing. It only downloads the PDF from my server. The printing is done from the PDF through Acrobat reader or what ever PDF reader program you use. If it will not print there is something else causing the problem. Make sure you can print something else before you start troubleshooting the PDFs not printing. Will the old free online catalog go away? No the free online catalog will always be free and available. This new PDF catalog is just to make browsing easier. The DVD catalogs will also always be available. Will there be a MAC or iPad/Tablet version? I only have the programming skills to write applications on the PC. I am working to see if I can find someone to write the app for the MAC. It's a simple app so hopefully I can find someone to do it for a reasonable price. There will not likely be an iPad/Tablet version. This is another product I own. My wife bought this for me as a gift a few years ago. 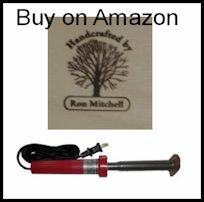 It is a custom branding iron for your wood projects. When you make that heirloom piece of furniture, apply your signature branding. One hundred years from now your family will love to see the care and attention you put into the piece. And best of all they will remember exactly who made it. These things are not cheap but they add so much to you final project that they do have value. The value of pride. Take a look.